As mentioned in an earlier post, SolidWorks has a routing feature that can be used to quickly generate detailed wiring harnesses in both 3D and 2D. As I learned today, this includes adding the connectors, plugs, clips and even insulation, whether it be from the default library of parts or those that you create on your own. 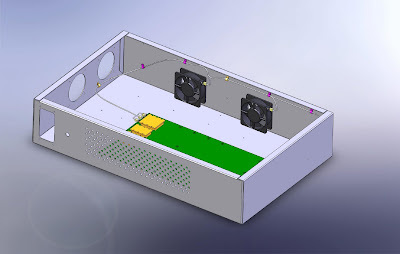 I also learned today how SolidWorks 2008 has improved features of previous SolidWorks releases, particularly in the generation of 2D wiring diagrams right from the 3D assembly. For example, in previous editions, the lines between connectors were just that. In other words they had no information from the 3D assembly tied to them. It was there only to show the link between the two ends of the wire. In SolidWorks 2008 however, if you update the assembly the diagram has a scaled representation of the route which will update accordingly. You can also manipulate the route within the 2D diagram and the part will update according to those changes. Also, you can create wires tht you use frequently and in various assemblies, then load them into an assembly, rather than having to redraw them every time you create a new assembly that uses that same wire. These wires (and any others you create0 are logged in a BOM complete with all of the wire details (what plugs/connectors are on the ends, length, gauge, color etc.) so that they can easily be mass produced. These are just some of the things I will use to create the prototype, use in production, and train our staff with. Day two of the Routing training will cover hoses, tubing and hard lines, so stay tuned for that next week.